You can tell that the director of “A Man in our House,” Henri Barakat, learned his trade in Paris. Here’s the story: during the period of British colonial rule, a student radical, Ibrahim Hamdy (played by Omar Sharif) assassinates the Egyptian prime minister. Beaten by the authorities, he manages to escape with the help of his fellow radicals and takes refuge with an ordinary middle-class family. The film has the feel of a classic French thriller. Claustrophobic scenes inside the family’s Cairo apartment alternate with shots of the Egyptian police as they close in on Ibrahim. The sleazy cousin finds out that the family is harboring a terrorist and threatens to reveal him to the authorities. 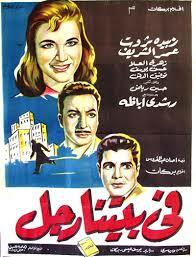 A romance blossoms between Ibrahim and Nawal, the youngest daughter. Of course it ends tragically, with Ibrahim sacrificing himself for the cause. But freedom is dearer than life, and Nawal understands this.